It's called Busy Work and it's amazing. Remember Space Team? The panicked, mobile-first cooperative adventure in which you and three friends navigate hilariously hard-to-parse Star Trek jargon until your inevitable, humiliating defeat? Busy Work is kinda like that, except transported into a grim-as-hell corporate office. It’s 2002, you’re sitting in front of a beige, boxy, Windows 2000 display, and the only path to victory is by sending as many emails as possible. Husband-and-wife duo Lisa and Matt Bethancourt have gone all out in bringing Busy Work to life. At Indiecade the game exists as four cubicles, each stocked with computers, phones, and a stack of meaningless TPS reports. Each round takes about five minutes, and your main duty is to send as many emails as possible. You do this by pounding out gibberish onto the keyboard, which is immediately transcribed into readable (and often hilarious) missives on the screen. Maybe you’re emailing your mom to show off your fancy new work address? Maybe you’re sucking up to the regional manager? While this is happening, the screen bombards you with menial tasks that need to be accomplished before you can get back to your inbox. Your phone will ring, which forces you to read back a script and put the interloping client on the other end of the line on hold. Occasionally you’ll need to fill out one of the forms on your desk and hand it off to your boss (role-played beautifully by one of the Bethancourts). Sometimes you just have to field some banal instant messages from the idiots you work with. The winner (or at least the weekly bonus earner) is whoever sends the most emails. "[The design came] from the time we spent in a corporate environment, but as far as making the world … we both grew up in Southern California and we went to Disneyland a lot, so we get a lot of influence from that," says Matt. "I just love creating spaces." The Bethancourts use the name Mouse & the Billionaire for their creative firm, and on their website you’ll see that they’ve authored a ton of exotic projects—some with more emotional weight than a silly corporate speedgame. Like, say, a curated collaboration between folk musicians that had never met before, or an installation that generates music based on geographic data. Busy Work, with its instantly relatable premise and intuitive design, is a lot less heavy, but you can still sense that it was built by artists. The potpourri around the each of the cubicles are super distinct and primed to specific characters—I sat at the desk of a clerk named Mary who had a tin full of mints and some dog-eared romance novels hidden in the crevices next to her monitor. Those are the little things that make the game special. 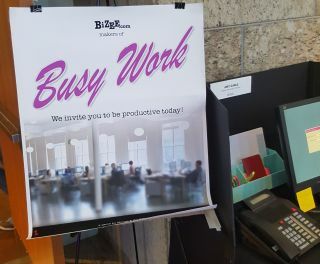 Matt told me you shouldn’t expect a home version of Busy Work anytime soon—because the phones, reports, and annoying bosses are all crucial to the experience—but Indiecade is its first public showing, so you never know what might come next.